As I mentioned previously in a piece about Joe Rogan’s struggle with vegans, I recently watched his somewhat-new standup special on Netflix. There was a bit in which he talked about something I’ve struggled with as a vegan: the apparent paradox of owning non-vegan cats. He clearly relished the opportunity to point out vegan hypocrisy, but it was nevertheless funny. I’ve had cats all my life. Growing up, we had as many as five or more at a time, producing an occasional chaos that I somehow can’t remember. 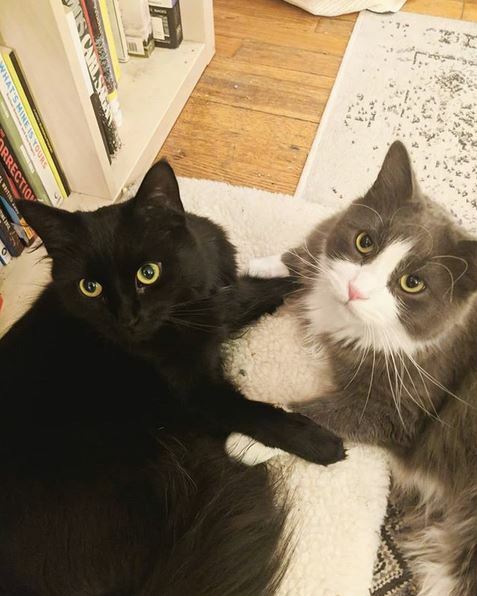 Over time, as some ran away and others passed, and myself and my brothers went off to college, the number of cats in my parents’ household was whittled down to just two. I missed my cats dearly when I was in college; one of the best parts of returning home was spending time with them. So, of course, I was destined to have a couple fur balls of my own post-graduation. Portland and Moose are around two and a half years old now. I had already been vegan for years before adopting them. If you’re a cat owner, too, you know the ethical discomfort that accompanies feeding time. Cats are obligate carnivores, and supposedly dogs are not. This means that dogs can (from the little reading I’ve done) be vegan with a well-planned diet, but cats cannot. Vegan cat food exists, but I’m skeptical. I don’t want to force my cats to be vegan; I worry that there may be consequences for their health, and one of them requires a special type of food for a urinary issue that I am certain is not available in vegan form (or, if it is, is likely to be extraordinarily expensive). Some of these excuses may sound familiar. People say these sorts of things in the course of providing reasons why they themselves cannot go vegan. I don’t have any good rebuttal to the accusation of hypocrisy. It does not make sense to value my cat’s lives over the lives of all the animals that will die to produce the food they eat for the remainder of their existence. But they are like my family — except way more annoying at times — and that will not change as long as they are alive. And after they die, I will probably adopt more cats. There are a few things that give me solace. First, cats don’t eat very much; only about 200 calories a day, so it’s not like having cats compensates for the reduced suffering that results from my veganism. Similarly, many people own pets, and in relation to meat-eating pet owners, I edge them out in the ethics department (although I worry that such comparisons can leave us prone to letting ourselves of the hook for moral transgressions). Finally, I’m optimistic that cultured meat will quickly make its way into pet food, so that perhaps in just a few years this moral dilemma will be resolved anyhow. And no, my cats won’t know it’s not “real” meat; they’re kind of idiots. Adorable, cuddly, obnoxious idiots.